NASA's "Mighty Eagle" soars during its successful first untethered flight on Aug. 8, 2012 at the Marshall Space Flight Center in Huntsville,Ala. NASA's "Mighty Eagle" — a robotic prototype for new landers to explore the moon and beyond — has passed a major test with its first successful free flight, the space agency announced this week. Without using a tether (a first for the vehicle), the lander took off, hovered at about 33 feet (10 meters), flew sideways, and landed safely on its prescribed target, video of the the Aug. 8 test flight shows. The entire flight lasted 34 seconds and took place at NASA's Marshal Space Flight Center in Huntsville, Ala.
Marshall Center engineers Logan Kennedy, right, and Adam Lacock check out the lander prototype, dubbed the "Mighty Eagle." Since its last round of tests in 2011, the Mighty Eagle team has made significant updates to the guidance controls on the lander's camera, furthering its autonomous capabilities. Testing will continue through the month of August. The three-legged spacecraft is 4 feet (1.2 m) tall and 8 feet (2.4 m) in diameter. It weighs 700 pounds (317 kilograms) when filled with its fuel, which is made up of 90 percent pure hydrogen peroxide, according to NASA. After the lander's previous round of testing in 2011, engineers upgraded the guidance controls on the lander's camera, improving its autonomous capabilities, NASA officials said. 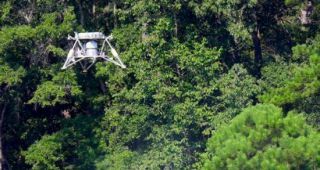 In tests scheduled through September, engineers plan to get the lander flying and hovering autonomously at up to 100 feet (30 m). "These lander tests provide the data necessary to expand our capabilities to go to other destinations," Greg Chavers, engineering manager at the Marshall Center, said in an Aug. 13 statement. "It also furthers our knowledge of the engineering components needed for future human and robotic missions." The Mighty Eagle's successful untethered flight came one day before another NASA lander prototype's fiery test failure at the agency's Kennedy Space Center in Florida. In that Aug. 9 test flight, engineers with NASA's Project Morpheus based at the Johnson Space Center in Houston attempted to make the first untethered flight of the Morpheus lander over a mock moonscape. A failure caused the Morpheus lander to flip over and explode shortly after liftoff. Project Morpheus officials are studying the failure and plan to upgrade a second Morpheus lander for future tests.